What the Luckiest People Think, Know & Do.. There are two kinds of ‘luck’ – the ‘luck’ that happens when things are completely outside your control and the ‘luck’ that happens as a result of spotting opportunities and your own positive actions. However, it’s always you and the way you think and act that determines how ‘lucky’ you are. It’s all about how we analyse the events in our lives, how we respond to them, and how pre-emptive and pro-active thinking can create the kind of life experiences we want. 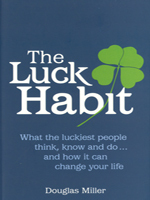 Using an easy-to-read, non-academic writing style and featuring interviews with top performers in the world of sport, music and business, speaker and writer Douglas Miller presents 20 key ‘Luck Factors’ – patterns of thinking and behaviour – which you can apply in all aspects of your life. Luck Factor 10 What’s the point?